In early 2011, a joint initiative was started under the auspices of SPARC, the International Ozone Commission (IO3C), the ozone focus area of the Integrated Global Atmospheric Chemistry Observations (IGACO-O3) programme, and the Network for Detection of Atmospheric Composition Change (NDACC). To aid digestion, an acronym of acronyms, SI2N, was adopted. Reports on the two workshops were published in SPARC Newsletters 37 and 39 (Harris et al., 2011, 2012 – http://www.sparc-climate.org/publications/).The main objective of SI2N is to assess and extend the current knowledge and understanding of measurements of the vertical distribution of ozone, with the aim of providing input to the next WMO/UNEP Scientific Assessment of Ozone Depletion anticipated for 2014. It is effectively a follow-up of the SPARC/IOC/GAW Ozone Profile Assessment (http://www.sparc-climate.org/publications/). Anything which was or could have been considered for the last Ozone Assessment will not be included. Papers published prior to 2011 will be assessed using the following criteria. The content of the paper must still be valid and not superceded by more recent work. Comparisons with model data or use in model runs can be included as long as they are using current datasets that will be used in SI2N. If a paper can be reasonably updated, then that is the preferable option. A more detailed understanding of satellite O3 profile data records is vital for further progress in O3 research. To this end, we made a comprehensive assessment of 14 limb/occultation profilers using ground-based reference data. The mutual consistency of satellite O3 in terms of bias, short-term variability and decadal stability is generally good over most of the stratosphere. However, we identified some exceptions that impact the quality of recently merged data sets and ozone trend assessments. Changes to measurement methods over Canada's 48-year ozonesonde record have been characterized and corrections applied. An estimate of the altitude-dependent uncertainty is added to each profile. The re-evaluated time series show negative trends in the lower stratosphere of up to 5 % per decade for the period 1966–2013. In the troposphere trends for the 48-year period are generally not significant. This suggests that free tropospheric ozone levels over Canada have not changed in nearly 50 years. GROMOS (GROund-based Millimeterwave Ozone Spectrometer) has provided ozone profiles for the NDACC (Network for the Detection of Atmospheric Composition Change) at Bern since 1994. 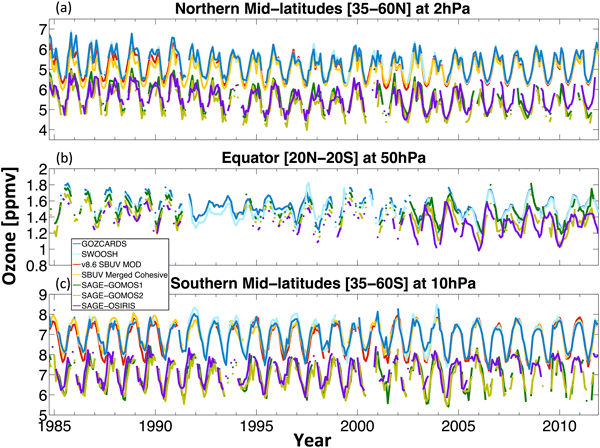 We performed a trend analysis of our 20 years time series of stratospheric ozone profiles with a multilinear parametric trend estimation method. With our estimated ozone trends we are able to support the stratospheric ozone turnaround. Besides a statistically significant negative trend in the lower mesosphere. Trends in the vertical distribution of ozone are reported for new and recently revised datasets. The amount of ozone-depleting compounds in the stratosphere peaked in the second half of the 1990s. We examine the trends before and after that peak to see if any change in trend is discernible. The previously reported decreases are confirmed. Further the downward trend in upper stratospheric ozone has not continued. The possible significance of any increase is discussed in detail. While global stratospheric O3 has begun to recover, there are localized regions where O3 has decreased since 1991. O3 in the mid-stratosphere is very sensitive to nitrogen chemistry, with increased NOy resulting in decreased O3. 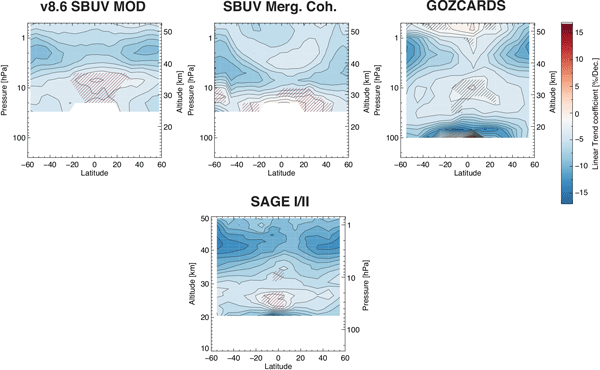 We show how the observed O3 changes in the tropical mid-stratosphere can be caused by long-term variations in dynamics which result in a decrease in N2O, an increase in NOy, and a resulting decrease in O3.